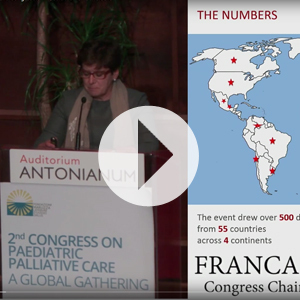 The 2nd Congress on Pediatric Palliative Care: a Global Gathering, organized by the Foundazione Maruzza Lefebvre D’Ovidio Onlus (Maruzza Foundation) was held in Rome from the 19th to the 21st of November 2014. The Congress was attended by 500 participants from 55 different countries worldwide – Western and Eastern Europe, Canada, USA, Central and South America, Australia, New Zealand, Asia and Africa – with scientific contributions from Researchers from 40 nations, plenary presentations by 20 international experts, 36 oral presentations and 128 posters presented by teams operating in different countries. The Opening Ceremony was held on the afternoon of the 19th of November. The event was opened Silvia Lefebvre D’Ovidio from the Maruzza Foundation. The Foundation’s President, Daniel M. Cardon de Lichtbuer, welcomed participants to Rome, followed by a brief welcome address by the congress Chair and Co-chair Franca Benini and Joanne Wolfe. Chris Feudtner, from the Philadelphia Children’s Hospital (USA), then gave a Key Lecture on “Hope in Pediatric Palliative Care.” Feudtner focused on two aspects: how the parents of a child affected by incurable illness make their choices regarding possible treatments, and how the professionals caring for the child can help and support parents in the decision-making process by providing useful information on the best strategies to follow. 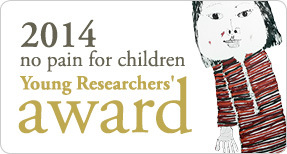 This was followed by the presentation of the 2014 No Pain For Children Award For Excellence In Paediatric Palliative Care awarded to the five best abstracts submitted to the Congress by Presenting Authors under the age of 35 years.